Can you believe this? Today is someone's birthday. Yes, today is the birthday of the original iPhone. It was actually announced5 years ago today by the late Steve Jobs. If anyone would have thought that day how this phone would have affected the mobile phone industry, they probably would have laughed and said No Way. Jobes had a sense that it would affect the phone and that it would be revolutionary. After three years in the making, from the first idea to the day that it was launched, Apple released the device hundreds of people on June 29th. This was not something that was normally seen, but since then, when an Apple device launch is announced, this scene has become the norm. With all of the various Apple products that have been produced since 2001, from the iPod to the iPhone to the iPod Touch and the iPad, Apple as a company as gone to the top of the ladder. The iPhone is now in the 5th version and has really become a product that has defined the company. As we move forward, it will be interesting to see what other products will be brought to the market. As we sit on the birthday and look back over the last five years, one can't help but wonder what was and is it about the iPhone that makes it so popular. It makes you wonder if it is the look or the design. It is the hardware underneath the design. It it because of the touch display or does it have something to do with something other than the product? Could it be the company or the management? It's probably a little bit of all of that. When this product first came out, it brought a new experience to mobile phone users. It was the touch screens, the OS, the screen itself and the achievement that Apple had developed by putting it all together. 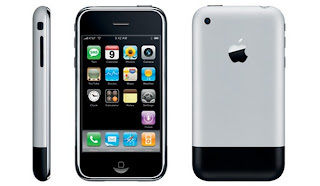 So Happy Birthday to the iPhone. 0 Respones to "Happy Birthday To..."